Rebecca Troth wants Magento to work on virtual reality and conversational commerce. Many of you might know Rebecca Troth. Why? She is pretty and funny, I mean pretty funny. She is smart too. With a Magento Certified Solution Specialist certificate under her belt, Rebbeca is a Channel Manager at Ingenico ePayments. This interview is for whoever wants to know Rebecca more closely. Muneeb: Rebecca, first of all thank you for giving us your precious time. You are currently a Channel Manager at Ingenico ePayments. Please shine light on your career for our readers. Rebecca: Yes, that’s right! I started work when I was 15 at a local fish and chip shop and haven’t stopped working since! I honestly don’t feel like I’m that far into my career and I am learning new things everyday. I got into ecommerce as a designer, then my role progressed into development, then project management, and now into a role managing partnerships at Ingenico ePayments which I am absolutely loving. I have always loved being social and helping others and this job gives me the opportunity to do both everyday in a field that I am passionate about, i.e. online retail! Muneeb: Since you have also worked as a Magento developer, could you please share your development experience with our readers? Rebecca: Funnily enough, it feels like a lifetime ago that I was in the development world but it has only been 2 years. The first Magento version I think I worked with was 1.7 and I remember falling in love with it like it was yesterday. I thought it was fantastic. Yes! I thought it was complicated too, but having come from a background of basic WordPress I couldn’t get over its power. Muneeb: As a Magento Certified Solution Specialist, what is the importance of this certification and what’s your advice to newbies who want to get certified in Magento? 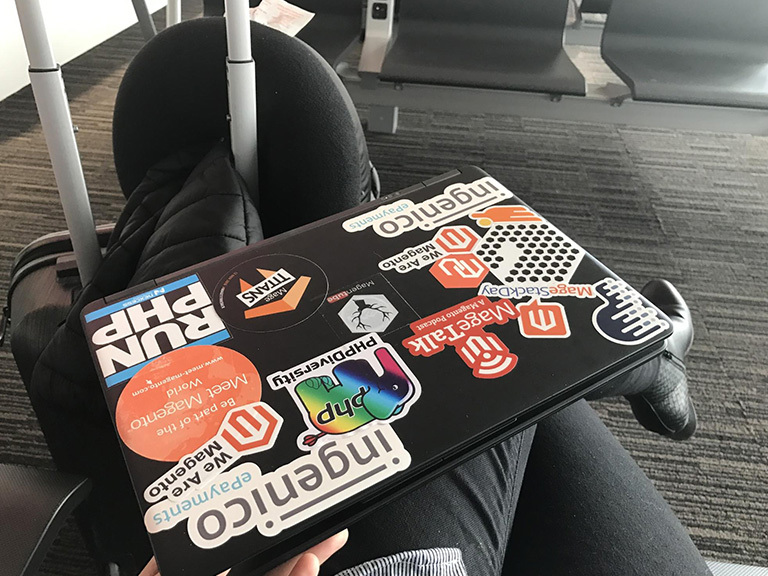 Rebecca: I guess having moved away from development, I wanted to prove to myself that I was still relevant to the Magento world. So, I set myself the task of becoming certified. My advice would be to study, practice and play with Magento but don’t forget to rely on your instincts as well. Being a Solution Specialist is about having the knowledge, but it’s also about being able to react and apply that knowledge in the best way for the merchant. Muneeb: With so many other ecommerce platforms available, what was your reason for going with Magento? What makes Magento more special than other platforms? Rebecca: To be honest, I didn’t really choose Magento. I went for a developer role at an agency that happened to focus on Magento and so that was what I worked with. Would I change it now I have more knowledge on the others? Nope! Magento has had its pitfalls, both technically and politically, but it is a solid platform with an amazing community and a passionate team behind it. Muneeb: What do you love the most about your job? Could you please share a picture of your workspace? Rebecca: I love the people, both internal and external. I get to steal the time of some awesome humans from all over the world! I also love how varying it is. I don’t actually have a permanent workspace. I am in a different place everyday: Meeting someone new, discussing something new, and planning something new. It’s so exciting. Like right now I’m relaxing at the airport after visiting our headquarters in Brussels! Muneeb: How would you differentiate Magento 1 and Magento 2? And which new features you would like to see in Magento 2 in the future? Rebecca: There are huge differences between them but they are also very similar. After all, both apps have the same purpose in life. Once the base is solid and stable, I would really like to see Magento achieve some innovative and exciting things with the platform involving virtual reality, conversational commerce, and whatever the next fad is. I would also like to see more advancements in the admin functionality for merchants using the system. Muneeb: Do you attend Magento Events? And did you get the chance to attend Magento Imagine 2017? How are important are these events for people who want to get associated with Magento? I will definitely not miss Imagine next year though. For the community to continue to grow and thrive, events are so important. But they are also important for personal growth. I have been an introvert my entire life, I swear some of my teachers thought I was mute but I doubt many would believe that about me now. I remember the first Magento event I went to was Magento Live UK in 2015, I only spoke to the people I went with and any time I was on my own I quickly pulled out my phone or laptop or anything I could use to hide my face from strangers. I still struggle with gathering the courage to mingle, but I am working so hard to change that. If you ever see me at an event, rocking and whispering to myself, don’t be alarmed! I’m not having a breakdown. I’m just trying to convince myself to go talk to people. Muneeb: How do you spend your free time? Rebecca: Doing anything but staying home! Events, parties, surfing, hiking, traveling, sightseeing, drawing, filming, editing, adventuring, eating, socialising, writing, reading, pretty much anything! Cramming as much as I can into any and all available time. My mom jokes that she has to book my time 3 months in advance but seeing as the next weekend I have free is sometime in July. Maybe, she wasn’t joking! Muneeb: Now, it’s time for a fun Rapid Fire round! Shopify or PrestaShop? This question offends me ? Muneeb: Name some people who have inspired you in professional as well as personal life. Rebecca: The cornerstone of my life that is my fiancé. Oh, and Thor. I like to think I was meant to be a Norse God. Muneeb: Magenticians is running an interview series. Who would you like to be interviewed next? Rebecca: Ooooo, this is a tough one! There are so many amazing people in the community that I would like to hear more from, off the top of my head I would say the guys behind the scenes of Mage Titans Italy that I am working with: Andra Lungu and Alessandro Ronchi. Tune in next week for an interview with another Magento maverick!